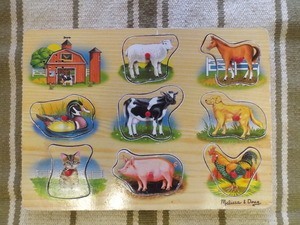 Puzzles were my daughter’s favourites toys when she was little. 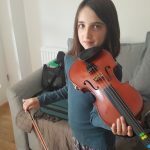 From the moment she discovered her first peg jigsaw at 1 year old to around the age of 4, she spent long periods of time every day completing various puzzles. 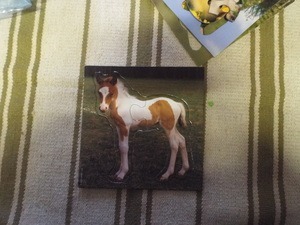 Puzzles are a material that your child can progress into from toddlerhood to childhood. What to present first and how to progress from simple to the more complex and from concrete to the more abstract one. 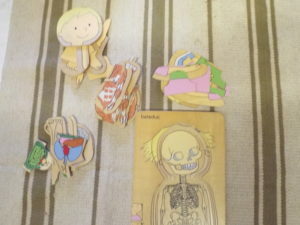 Possibly a single pictures or shapes jigsaws to isolate what you want to teach. I started with realistic pictures as it’s concrete for the child. Then I introduced shapes jigsaws. 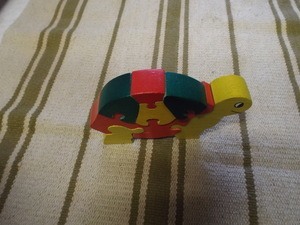 You can find single shape or 3 shapes jigsaw on Absorbent minds. I have the 3 shapes one. 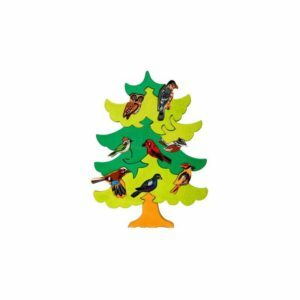 Unless you buy specific Montessori material, it’s quite hard to find single picture or single shape puzzle, so I introduced early on 3 to 5 pieces jigsaws to finally offering many pieces puzzles. Goula, Hape, Goki are great brand that offer big knob puzzles. 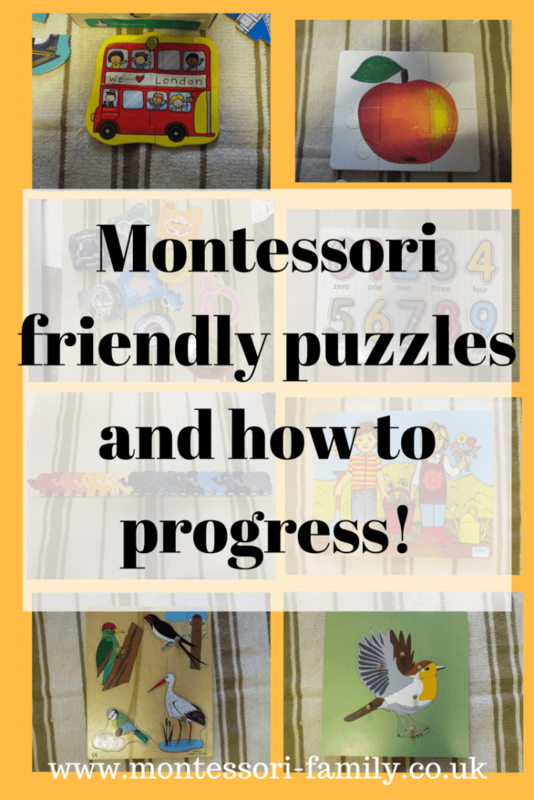 To start with, it’s easier when the pieces match the pictures underneath then you can have only the shapes to help the child to find the right piece. Some jigsaws have a surprise underneath too. 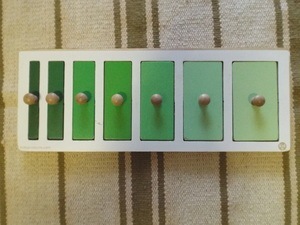 To refine the 3 fingers grip even further, you can also offer small knobs puzzles. this one (the missing piece is somewhere else in my house!) 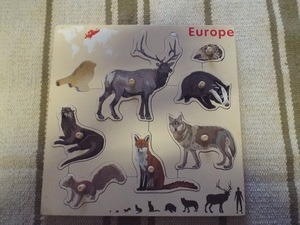 is all about the animals form Europe, I have another one from Africa. This one is from Melissa and Doug, they have many very realistic puzzles. This one is supposed to make the animal sounds when you place the pieces back on, I never add the batteries. Here the images are the same but in a different size. You can also offer graded colour jigsaws. All the above are one to one correspondence kind of jigsaws. I liked to extend the possibilities of those by matching the pieces to pictures, the shapes jigsaws by introducing cards to match each shape to an outline or if the shapes were of different colours, I used to suggest to match each piece to a coloured card. 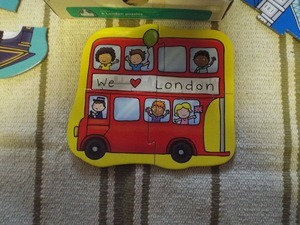 If you have lost a piece, don’t throw away the puzzles, stick a magnet on the back and use them on the fridge! Or keep the piece for a treasure basket or for a matching game. Here come the real jigsaws! When you make a picture with different pieces. 2 pieces jigsaws are the first ones to introduce. I had many 2 pieces jigsaws from Orchard toys. I found most of them in charity shops. These layered jigsaws are from Beleduc, now rebranded Hape. You can often find them at Lidl. I have the boy, the girl and the pregnant lady. these ones were so hard to master for my children! I do remember having one when I was little. This one is from Oxfam. I have my eyes on this one at yesbebe website! And very difficult jigsaws! Puzzles are seriously one my weakness and I still buy new ones and find bargains in charity shops to offer variety in my playgroup (and my two children are now happily completing 50 to 100 pieces jigsaws at home). Which ones are your favourites jigsaws or puzzles? Need more ideas? Check my clutter free Christmas gifts list.